The next time you're on a camping trip, try sticking your trusty plastic water bottle on the fire to boil up some grub. 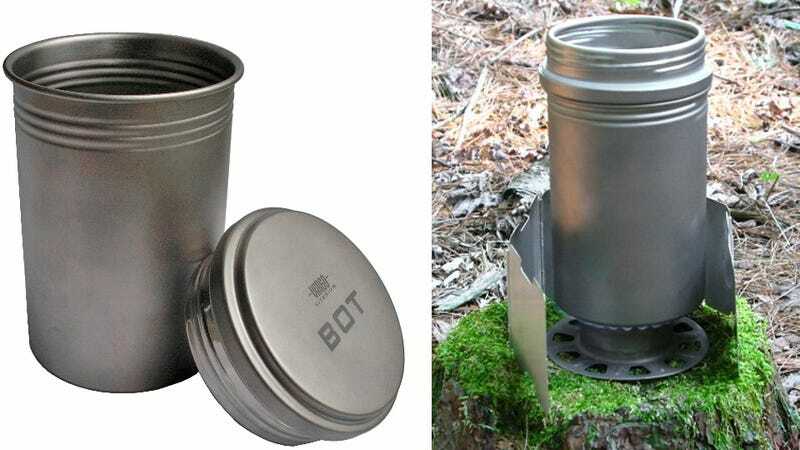 It might be lightweight and easy to carry, but as it melts away you'll soon realize you'd probably be better served by this titanium option that doubles as a fire-safe cooking pot. Once you get over the sticker shock of the Titanium BOT's $100 price tag, you'll realize it's the perfect accessory for hiking trips where you want to keep your backpack as light as possible. It holds a full liter of water, but weighs just 133 grams when empty. And the easy screw-on cap is kept sealed by a heat-resistant rubber O-ring that won't melt away when you're using it as a pot to boil water. But if you're still hesitant to drop a c-note on a water bottle, remember that titanium is one of the awesomest materials known to man—and every sip you take will be like drinking from a stealth fighter.